Collateral Damage is a new book released today. It is the fruit of a ministry partnership of Christian Focus Publications and Practical Shepherding, the ministry of my friend Brian Croft. At twelve years old, James Carroll became the collateral damage of his pastor father’s infidelity and his parents’ divorce. With his world completely shaken and identity in shreds, he could hardly process what was happening, let alone begin regaining normality. 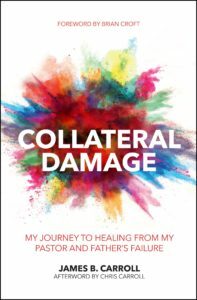 In Collateral Damage, Carroll, now a pastor himself, presents the specific ways in which God has worked in his life during and since that time – healing wounds, revealing sin, and restoring life. This is a highly practical book, showing the gospel as the power of God to save, to restore, and to heal. Get yourself a copy from Westminster Books or Amazon.